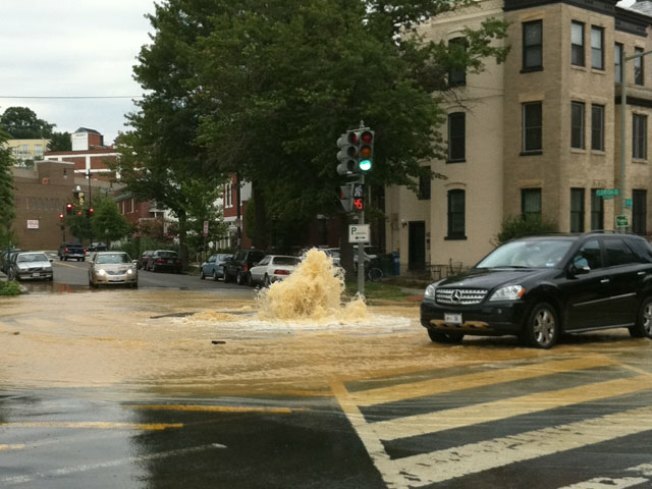 A couple minutes after 4 p.m. yesterday, a water main break at the intersection of U Street and Florida Avenue N.W. caused a number of businesses to close early, and sent neighbors scrambling to protect their basements from flooding. The section between 16th and 18th streets was closed to traffic for a couple hours as gallons of water gushed onto the street. According to a D.C. WASA spokeswoman, the break was the result of a 12-inch coupling that popped off after crews had performed a routine valve replacement the night before. Water had already been shut off for much of the morning, but when water pressure returned around noon, the valve malfunctioned, causing the coupling to break. Businesses on the east side of 18th Street between Florida Avenue and Columbia Road were forced to close early or endure expansive lakes of water. Niel Piferoen, owner of the Belgian café and restaurant Locolat, bemoaned the lack of water for severely limiting his menu options. "There’s only a limited service that you can do [without water]," said Piferoen. "You couldn’t sell any coffee, you couldn’t sell any tea; the only thing you could do was sell beer and wine. You can’t even do any food because you can’t do any dishes." An employee at Duccini’s Pizza, an establishment across the street, echoed Piferoen. "The police and fire department blocked all the [streets], so there is no walking," said the employee, who wished to remain anonymous. "So even if you work in the store, you can’t come in or drive, so everybody’s in. We had a few orders that we couldn’t deliver. There was not even carryout." Some business owners, however, did not lose water, despite their proximity to the break. For example, El Tamarindo, a Mexican/Salvadoran restaurant across the sidewalk from the spewing water main, was fine -- underscoring D.C.’s occasionally perplexing water system. The break was fixed by 1 a.m. this morning, but WASA has informed City Desk that there have been reports of water damage on the 1700 block of U Street, the severity of which is still unknown. U Street Water Main Leaves Businesses High and Dry was originally published by Washington City Paper on July 28, 2010.